Well restoration is not exactly our trade, but due to the nature of the older properties we tend to work on, Earthouse quite often uncovers a disused well, often in a bit of a sorry state. Some customers choose to cover them over for safety reasons or simply because they do not want to be able to see them. 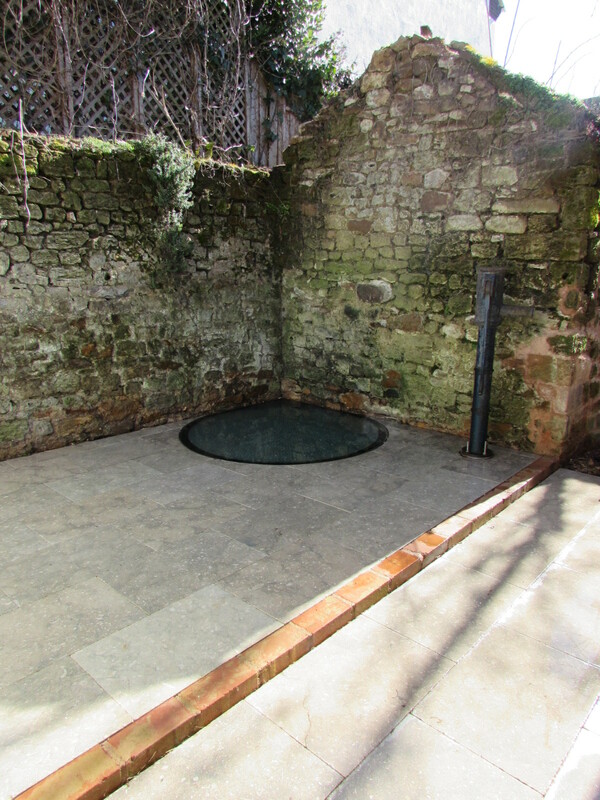 There are really effective ways to restore a well and make it into a feature, which is what we did in a back yard, as shown below. 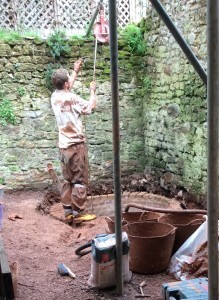 This well was covered in concrete; we learnt that the back yard of the property had once been used a wash house for the village so we felt it was right to proceed with the well restoration. Winching the bucket up – one load of silt at a time! We drained the well a few times, first manually then with an electric pump; the pump to the well was also in the backyard, but was broken. Unfortunately due to an oil leak from another property we are unable to use the water. If you are restoring a well please be aware that if you intend to draw water from it, you will need to get the water tested and a license from the local authorities. You can get free advice and apply for a licence on the GOV.UK Water abstraction and impoundment page. DEFRA have provided more information in their consumer advice booklet. The well was about 12” deep and made of earth. The top area of the well needed reinforcement which we did with layers of red brick as shown. 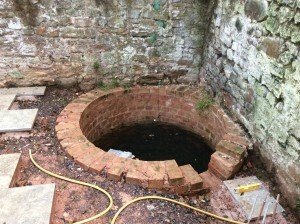 The well full or water again – this project took some time! The water level nearly at the top of the well a couple of days after draining. Brick work effectively complete. Because the area will be in use we needed to ensure that the well was safe. It was decided to lay a sheet of reinforced glass over the well. This allowed us to also install lighting in the well which adds to the atmosphere when the yard is being used in the evening. 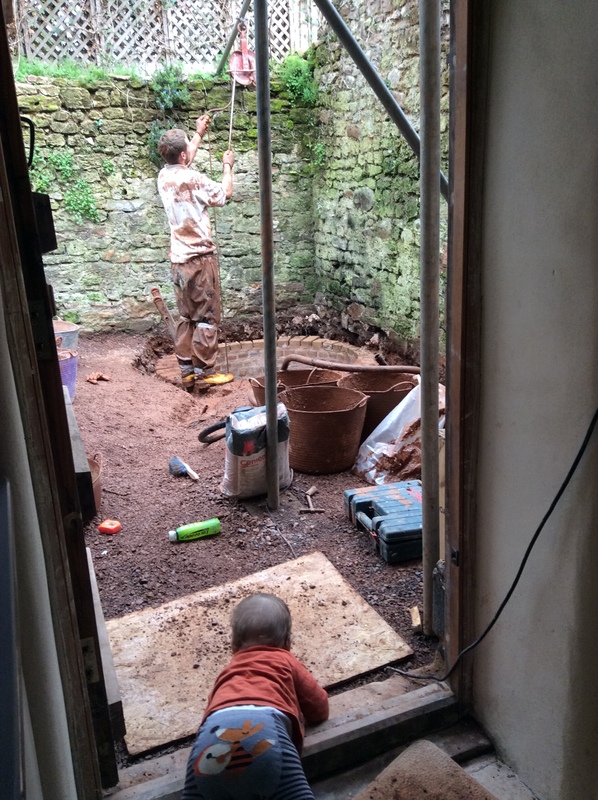 We found that Veon Glass in Totnes were really helpful and provided us with a great bespoke product. We also reinstated the old iron pump. 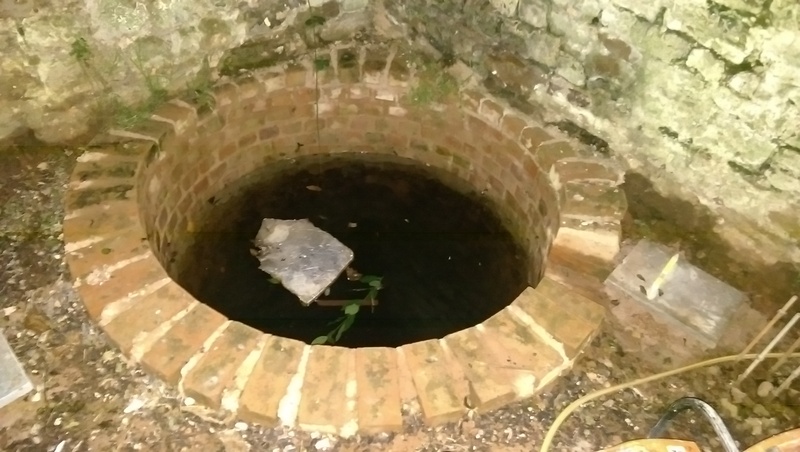 Below you can see photos of the fully restored well. 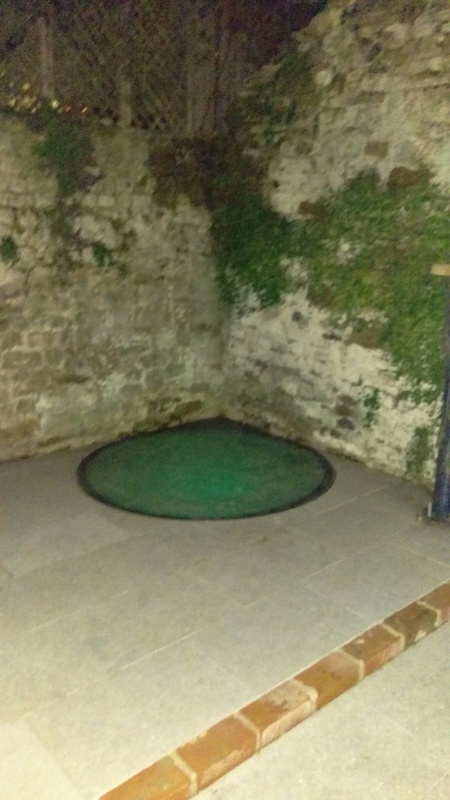 The final picture shows the well at night with the green lighting glowing. The well at night – green lighting. If you are interested in well restoration, please contact us.